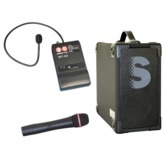 Portable sound reinforcement systems powerful enough for a small school hall or audiences of 500 indoors or out. 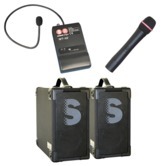 These systems have the same excellent sound quality as the Micro ... its just that they have more power and more facilities. Compact4 units are rechargeable and Compact 2M units are mains powered.